(Newser) – A former top Chinese general under investigation for major corruption has killed himself, official media reported Tuesday, denouncing his death as a "despicable" act to escape punishment. Zhang Yang was placed under investigation in late August on suspicion of bribery, having a large amount of property that he could not account for, and other acts that "seriously violated" laws and regulations, the AP reports. The Xinhua News Agency and state broadcaster CCTV said Zhang hanged himself last week at his home, to which he had been confined during the investigation. No other details were given. Zhang had formerly headed the Political Work Department under the dual government and ruling Communist Party's Central Military Commissions that oversee the People's Liberation Army. Official media said investigators closed in on Zhang using testimony given by two other former top generals, Xu Caihou and Guo Boxiong, earlier high-profile targets of President Xi Jinping's sweeping anti-corruption campaign. 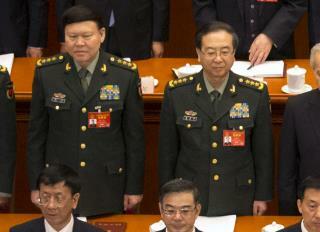 Xu and Guo had also been Central Military Commission members. Xu died of cancer in 2015 before facing court martial, while Guo was sentenced to life in prison last year. Since coming to power in late 2012, Xi has launched a wide-ranging crackdown on corruption that has felled scores of mid-to-high-ranking officials. Gotta' admire Chinese efficiency and frugality with the people's money. While the Liberals in America all point to Europe and their socialist programs the communists in China give us all lessons on how to limit unnecessary government spending.